We have one of those multi-function scanner/printer/fax/copier machines at work, the Brother MFC-8860DN. After a few years of faithful service, it started displaying “Fuser Error” and refused to print. We needed a new one fairly urgently, so I immediately bought a new HP one as replacement, but I wasn’t quite ready to send the old Brother to the graveyard and decided to try replacing the Fuser. 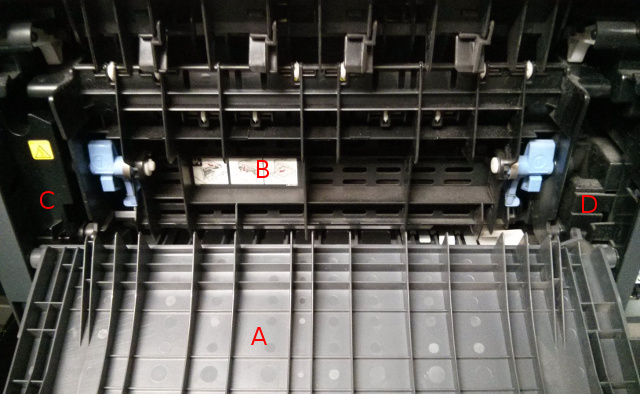 Having switched off the power, I pulled the back cover off the printer and located the fuser unit. This wasn’t too difficult to get to: there are two panels which pop out, two screws to remove, and two more covers to gain access to the connectors for the heater and sensor cables. The picture below shows the panels/covers to be removed. The Panels A and B can simply be popped out by bending one of their plastic “hinges” at either the left or right hand side. The cover C is held on by one cross-head screw, and the cover D simply pops off if you push on the spring tab (near the letter D below). Having removed cover D, you will gain access to another cross-head screw. 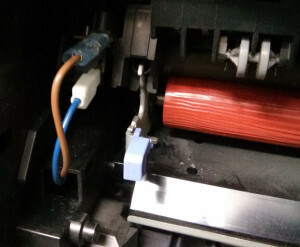 After removing those two screws, and disconnecting four cable connectors, the Fuser can be lifted out of the printer. The Fuser is basically just a heated roller, so there are only a limited number of things that could go wrong. For example, it could be a loose connection, a burnt out heating element, or a faulty sensor. Having pulled off the two spade connectors, I measured the resistance and they were open circuit. Concluding that the heating element had burnt out, I ordered a new Fuser unit (Brother LU7941001). When the new unit arrived, I measured the resistance across the same two terminals and found about 4.5 ohms. So, if you have access to a multimeter, this is a simple way to test if the heater element has burnt out. The new Fuser will arrive with its pressure roller set in the “low nip pressure position”. Basically, before installing, you just need to push up on the two blue tabs to release two spring loaded levers. There are (poorly) illustrated instructions included with the Fuser. Replacing the left hand cover (C) in the picture above is a little bit fiddly. It has two tabs which slots into a couple of holes in the side panel, then needs to be pushed down and rotated backwards to get the screw hole to line up. Having done this, the printer was back in operation again! Thank you for your writeup with pictures. I ran into the same issue with the cover on the left. I didn’t run into the two-level issue since I was taking a fuser from a machine with a memory problem and putting it into a machine with a bad fuser. Where did you get your fuser from and how much was it? I’ve found you can pick up these older machines with perfectly good fusers for <$100. Don’t you know is it possible to fix fuser unit by myself. I have this model http://pc24.de/fixiereinheit/hp/rm1-1083-070cn.html and it is too expensive for me to buy it. I will be very happy if you proceed me even one link or advice about it! Dude, you rule. It was easy enough to find a replacement fuser online, but without your instructions, there’s NO WAY I’d have succeeded. so, I have a new fuser, and the nip position is not apparent to me. The new fuser has a black plastic piece held in by a spring clip, and also on the bottom of those arms is a spring–these pieces are not on the old fuser I removed. I’m not sure what exactly to release with the blue tabs on those arms. Hi Nancy, I’m not sure exactly what you mean (also, my own memory of doing this is a bit hazy now, as it was about 3 years ago when I did this). Maybe you could upload a picture somewhere, and I could perhaps figure it out from that? does anyone know what machine error means after it’s shown fuser error (on a Brother 8860dn)? It sounded like a dead fuser, but wasn’t sure. Also, is there a maintenance 64 on one of these and what does that mean?